The benefits of prescribed fire in the Southern "pineywoods" are many and varied—and because of the passion of folks who love and believe in these legal and carefully-planned controlled fires and their results—they are becoming increasingly well-known and appreciated, according to a wildlife biologist and forester with the S.C. Department of Natural Resources. For more information on prescribed burning, visit the "Benefits of Prescribed Burning" section on the DNR website at http://dnr.sc.gov/burningbenefits/index.html. According to Stowe, prescribed fire can also be used in more sophisticated ways—for example, to prune and thin in stands of longleaf pine. The ability of fire to kill or topkill (which inhibits growth) hardwoods such as red maple, sweetgum, water oak and other species that are generally undesirable in longleaf woodlands and savannas, is well known. Less well-known is the artful use of fire to prune the lower limbs of young longleaf pines; to reduce the number of trees in longleaf stands that are too dense; and to remove other pine species, particularly loblolly, from these stands. 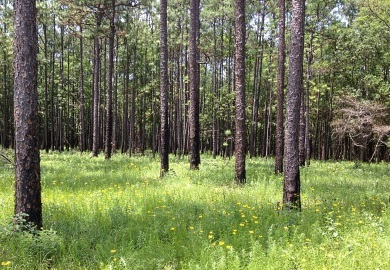 The need for thinning longleaf stands and for removing wildings (pines that have volunteered into longleaf stands) is common and usually obvious. 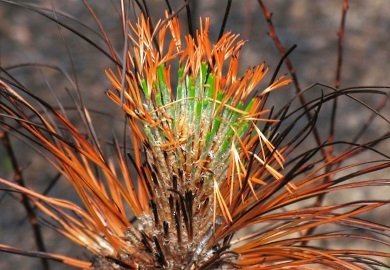 Sometimes longleaf was planted thicker than it needed to be, and perhaps mortality of planted longleaf was expected but did not happen, or longleaf or other pines seeded into planted stands from nearby mature trees, or too many seedlings arose in sites being naturally regenerated. On some occasions, landowners' management values and objectives change, or simply their perspective—what looks like a nice stand of grass-stage longleaf today, may later seem far too dense. For various reasons, many landowners don't want dense pine stands. Moreover, some government cost-share or other incentive programs aimed at improving early successional wildlife habitat mandate that pines be planted at a wide spacing in order to encourage development of groundcover. This approach promotes good early successional habitat, at least initially, but it may also lead to larger limbs that are retained for a longer period of time, if not for the life of the tree. A stand of open grown longleaf that is not properly burned (all burns that can be conducted on a given site are not equal) will retain low limbs that may produce as much shade and inhibit groundcover as much as the tightly packed trees in a high density planting. Open stands of longleaf pine that have nice cylindrical boles (main stem of tree) with few limbs are a result of either proper prescribed burning practices and/or stands that grew densely at one time but were later thinned. By burning under the right conditions, Stowe said, land managers can kill or inhibit the retention of lower limbs. This practice makes the first log more valuable by making it clear of knots. Moreover, it allows more sunlight to reach the ground, and sunlight is a vital, often the limiting, factor in the quality of groundcover that grows on a site. Groundcover such as native grasses and legumes provide valuable cover and food sources for wildlife, fuel for subsequent fires, and many species are attractive and desirable for their own sake. Plus, legumes fix nitrogen. For landowners keen to produce timber products as well as wildlife habitat, all else being equal, a tract of land can grow more and higher quality timber while still producing early successional habitat when the trees lack low limbs. Historical photographs often suggest this phenomenon—dense stands of large, clean-trunked longleaf or shortleaf pines of impressive and valuable timber volumes, yet with an apparently continuous and intact groundcover. In other words, one need not necessarily choose between maximizing financial returns or the maintenance of prime wildlife habitat and aesthetic attributes, especially when managing longleaf pine on longer rotations. Fire can also be used to kill unwanted pines that have volunteered into a site or those that were planted too densely. Given that loblolly is less fire tolerant than longleaf, fire of a given intensity will kill young loblolly while only pruning longleaf.